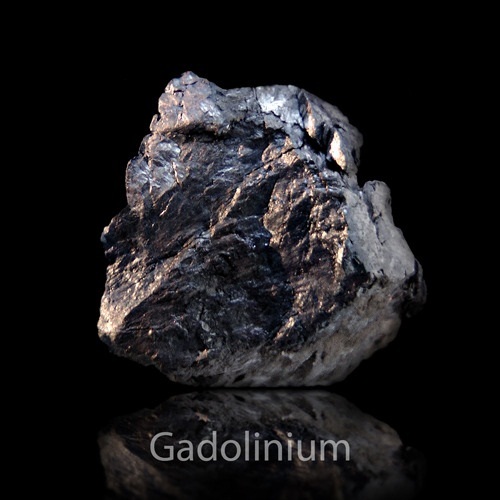 Gadolinium (pronounced as GAD-oh-LIN-ee-em) is a soft metal belonging to the family of rare earth metals . 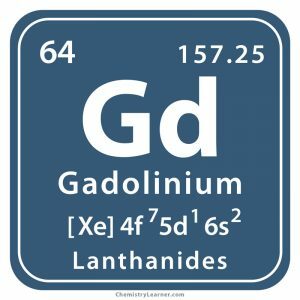 Denoted by the chemical symbol Gd, it has seven naturally-occurring isotopes of which Gadolinium-160 has the longest half-life . Trace amounts of the element are present in monazite and bastnaesite minerals with an abundance of 6.2 mg/kg in the earth’s crust. It is commercially produced through ion exchange and solvent extraction using those minerals, and also by reducing anhydrous gadolinium fluoride with calcium . Origin of its Name: It is named after the Finnish chemist and physicist Johan Gadolin. 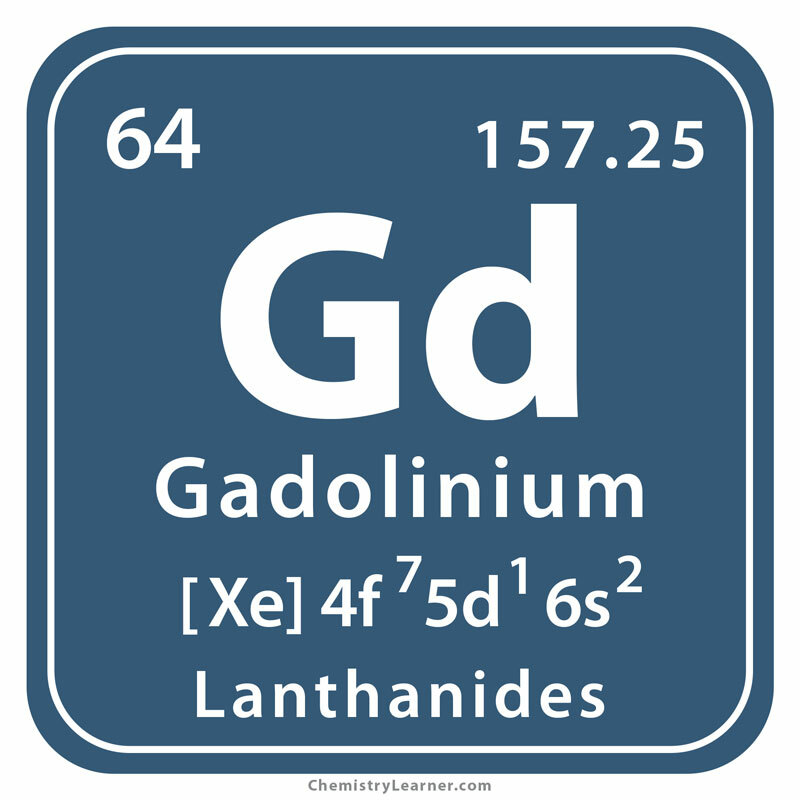 Who Discovered Gadolinium: Jean Charles Galissard de Marignac was the discoverer of the element. According to Marignac, he was sure about the existence of another element in the didymium mixture found by Carl Mosander, the Swedish chemist. When scientists Marc Delafontaine and Paul-Emile Lecoq de Boisbaudran at Paris analyzed the mixture, they found spectral lines that did not match with the source. 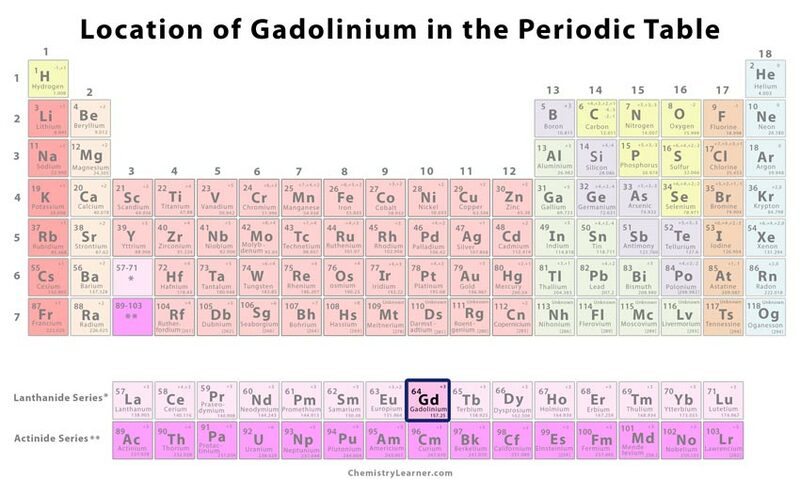 In 1880, Marignac successfully isolated the new element from it followed by Boisbaudran in 1886 who named it gadolinium . Iron and chromium alloys containing up to 1% of gadolinium have a greater resistance against oxidation and high temperature. Gd is also added to alloys used in magnets, storage disks, and electronic components . The ability of the element to capture neutrons makes it useful in control rods of nuclear reactors [1, 2]. Gadolinium is combined with yttrium to make garnets that have microwave applications . Gadolinium-based agents are used in MRI and CT scan procedures even though the element does not exhibit any radioactivity . There is no information about any adverse risks on humans upon its exposure. However, in some instances, Gd-based MRI contrast agent has seemed to cause mild side effects like allergic reactions, nausea, and vomiting . Since gadolinium has magnetic properties, its temperature increases under the influence of magnetic field and decreases when withdrawn . The cost of the element may vary between $450 and $500 per 100 grams.